Vagante, the fun but hard-as-heck dungeon crawler I played and enjoyed back in June, has been making some progress. And given what a charming little game it was when I first struggled to get through it, that's a good thing. It looks like the folks at Nuke Nine have been hard at work! You can check out their Kickstarter page for more info and to download a free demo of the game. If you didn't get a chance to see it last time around, it's a bit like Spelunky with more of a traditional action RPG leveling system. Players equip weapons, level their characters, and fine tune their skills to battle their way through dungeons full of monsters and traps. 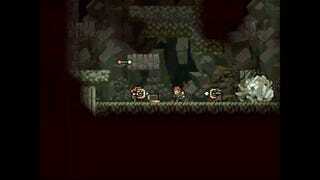 And like Spelunky, it's also hard as all get-out. You can track the game's progress here. Here's what the alpha looked like when I last played it.